Win The Florida Project: Filled with childhood wonder | SWITCH. 'The Florida Project' is the story of precocious six year-old Moonee (Brooklyn Prince) and her ragtag group of friends whose summer break is filled with childhood wonder, possibility and a sense of adventure. Living at a motel in the shadow of Disney World, Moonee is seemingly oblivious to the struggles of adults around her, including mother Halley (Bria Vinaite), and motel manager/father-figure Bobby (Willem Dafoe). A vibrant yet heartbreaking portrait of life on the fringe, the film garnered critical acclaim at Cannes and an Oscar nomination for Willem Dafoe. Click here to read our theatrical review of 'The Florida Project'. The 'The Florida Project' competition has now closed. Winners will be announced shortly. Competition opens at 5pm AEST on Sunday 15th April 2018 and closes at 11:59pm AEST on Sunday 22nd April 2018. Five winners will be chosen at random on Monday 23rd April 2018. To successfully win, entrants must fulfil the above entry conditions before the time the competition closes. Current members/followers are eligible to enter the competition. Only one entry per person. Only one winner per household. To be a valid winner, the entrant must not have won a prize from SWITCH within the last 28 days. Each winner will receive one Blu-ray copy of 'The Florida Project'. By entering, you agree to receive occasional emails from SWITCH in the future. If you decide to unsubscribe from these updates, any further entries will not be applicable. Only Australian residents are eligible to enter. 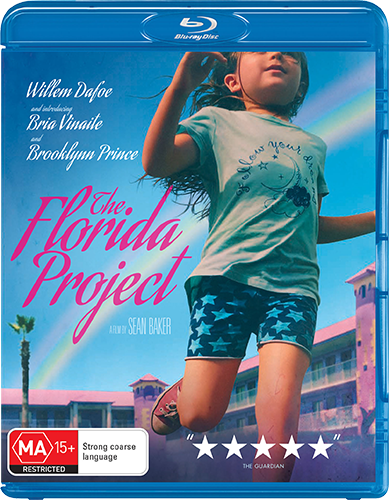 'The Florida Project' is available on Blu-ray, Digital and DVD on Wednesday the 18th April 2018 from Icon.